London's Parks and Gardens - Londons Gardens and Parks Near London. | Londons Gardens and Parks Near London. This book takes the reader on a guided tour of London’s public squares, community and allotment gardens, front gardens and window boxes – and the myriad and monumental public parks, from the grand formality of Hyde Park and Kensington Gardens to the wild heathland of Hampstead and the commons. 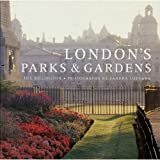 Illustrated with photographs that capture all the diversity of London’s green spaces, presenting a unique and fresh viewpoint on the familiar, crammed with intriguing information as well as practical details, this book is for for Londoners, gardeners and environmentalists, and for all visitors to the city.